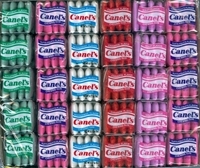 Canel's gum is similar to chiclets gum, however it is a mexican gum. Canels chewing gum comes in 5 assorted flavors including peppermint, cinnamon , spearmint, viloet and tutti frutti. Each box has 60 packages of individually wrapped, assorted flavors, 5 pieces of tab gum per package, giving you a total of 300 pieces of canels gum. Now that is hours and hours of chewing fun. We have other mexican gum like pica gomas bubble gum, bubbaloo bubble gum in blueberry, sour blue berry, cherry and banana flavors. We also Rellerindos Mexican Caramels, Peanut Mazapan ( Marzipan) By De La Rosa and Palerindas Tamarind Flavored Mexican Suckers which can all be found in our mexican candy section.